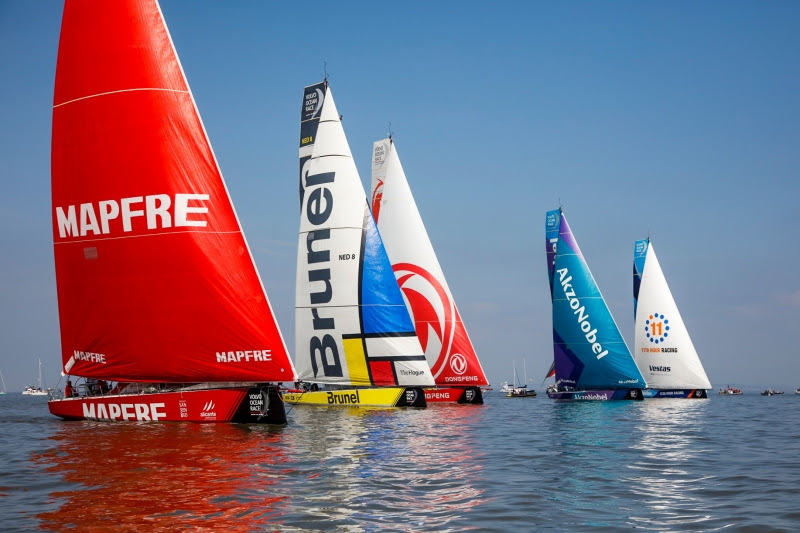 The Volvo Ocean Race fleet had a slow start to Leg 10 as a high-pressure system brought bright sunny skies and warm weather but very little breeze to Cardiff on Sunday afternoon. With nearly no wind at the scheduled 1500 UTC start time, the Race Committee pushed a short postponement to allow the tide to turn, so the strong tidal flow would assist in pushing the fleet out to sea. The inshore portion of the race start was also cancelled in an effort to get the fleet out of the Bristol Channel before the tide turned again on Sunday evening and the boats would have to fight the current to clear the channel. The Spanish team MAPFRE led across the starting line in a slow motion ballet, with Team Brunel, Vestas 11th Hour Racing, team AkzoNobel and Dongfeng Race Team alongside them. Both SHK/Scallywag and Turn the Tide on Plastic found themselves too close to the start line with the current pushing them over early. As they manoeuvred to get room to start on time, Scallywag was penalised for not keeping clear of Turn the Tide on Plastic and needed to offload a penalty turn putting them at the back of the fleet. Leg 10 is a 1,300 nautical mile sprint – at least it will be once the wind picks up – from Cardiff to Gothenburg, Sweden. The results of this leg could be critical in determining the overall winner. Skipper Charles Caudrelier’s Dongfeng Race Team leads MAPFRE by just one point, with Bouwe Bekking’s Team Brunel a further two points adrift. “We are happy with our position and excited about the next leg,” Caudrelier said before leaving the dock. “It’s going to be a very tricky start here in the Bristol Channel,” was the view of Xabi Fernández, the skipper of MAPFRE. After 30 minutes of racing in extremely light winds, MAPFRE was leading Vestas 11th Hour Racing and Team Brunel, while Dongfeng Race Team sacrificed some distance to the leaders to find clear wind nearly half a mile behind their rivals. Despite the light winds during Sunday’s start, the pace is expected to pick up and the ETA into Gothenburg is Thursday night and into Friday. The mild, sunny weather made for an extremely busy Race Village at Alexandra Head in Cardiff Bay, with crowd numbers pushing well past the projections of local organisers.